Modern Science collides with the Age of Dinosaurs in this exciting international historical mystery and suspense thriller. 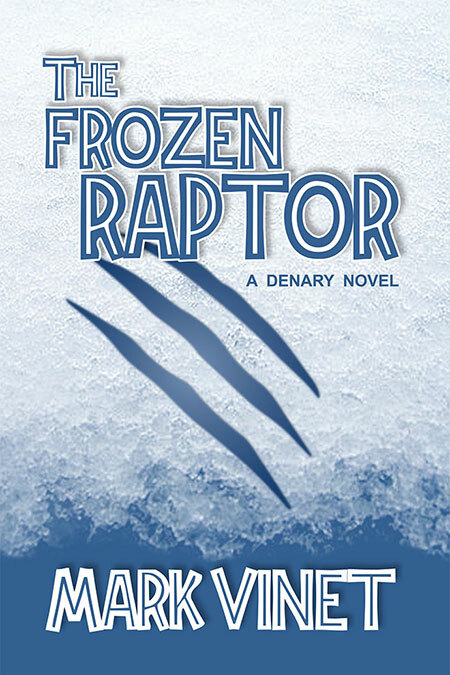 Successful author MARK VINET presents his fifth Denary novel "The Frozen Raptor", an intelligently crafted page-turner about ambition, greed, intrigue, money, and power. Embark on an incredible journey from the Caribbean to South America and Antarctica in the search for the secrets of... the Frozen Raptor. 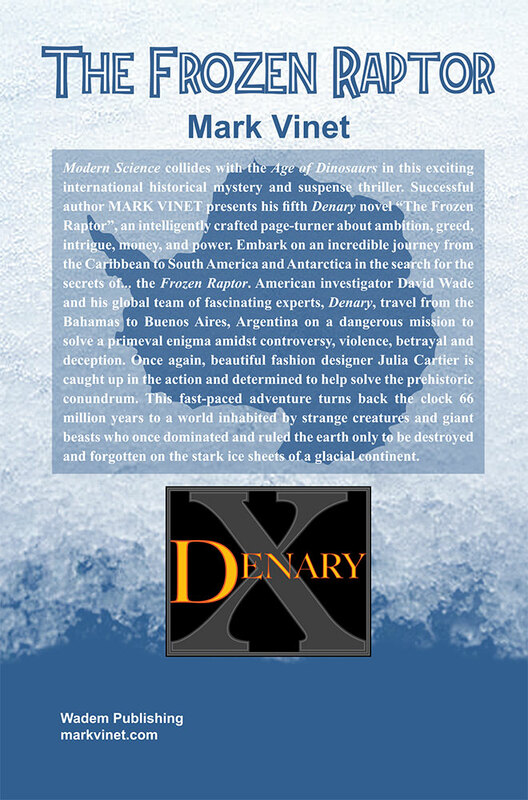 American investigator David Wade and his global team of fascinating experts, Denary, travel from the Bahamas to Buenos Aires, Argentina on a dangerous mission to solve a primeval enigma amidst controversy, violence, betrayal and deception. Once again, beautiful fashion designer Julia Cartier is caught up in the action and determined to help solve the prehistoric conundrum. This fast-paced adventure turns back the clock 65 million years—a world inhabited by strange creatures—giant reptiles who once dominated and ruled the earth only to be destroyed and forgotten on the ice sheets of a glacial continent. 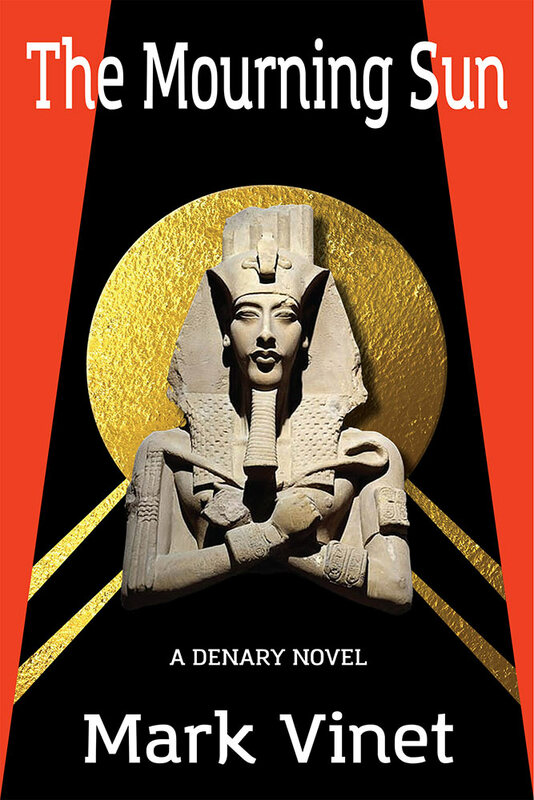 Modern Egypt collides with the Golden Age of Pharaohs in this exciting international historical mystery and suspense thriller. Successful author MARK VINET presents his fourth Denary novel "The Mourning Sun", an intelligently crafted page-turner about family, intrigue, power and ambition. Embark on an incredible journey from NYC’s Central Park to the Middle East in the search for the secrets of... the Mourning Sun. American investigator David Wade and his global team of fascinating experts, Denary, travel along the mighty Nile River to the modern cities of Cairo and Alexandria, and the ancient sites of Giza, Amarna, Luxor, Thebes, Karnak and the Valley of the Kings on a dangerous mission to solve a pharaonic enigma in the shadows of the Great Pyramids amidst controversy, violence, betrayal and deception. Once again, beautiful fashion designer Julia Cartier is caught up in the action and determined to help solve the archaic conundrum. 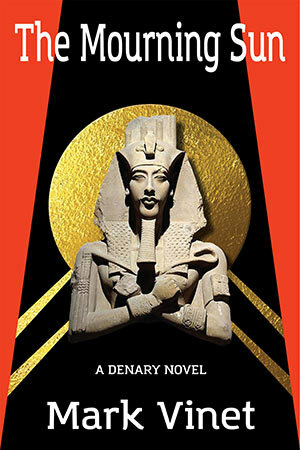 This fast-paced adventure turns back the clock to King Tut, Queen Nefertiti, Akhenaten and the year 1341 BC—a civilization controlled by a powerful Dynasty—Kings, Queens and Gods who ruled the greatest empire of ancient times and gave birth to a new religion that crossed the Red Sea and changed the world forever… and is still with us to this day. Modern America collides with the Civil War Era in this exciting international murder mystery and historical suspense thriller. 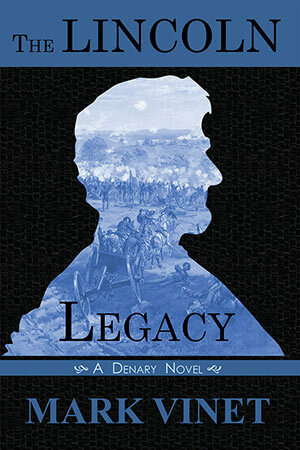 Successful author MARK VINET presents his third Denary novel "The Lincoln Legacy", an intelligently crafted page-turner about family secrets and revenge. Embark on an incredible journey from NYC’s Midtown Manhattan to Canada and along the United States Eastern Seaboard in the search for the secrets of... the Lincoln Legacy. 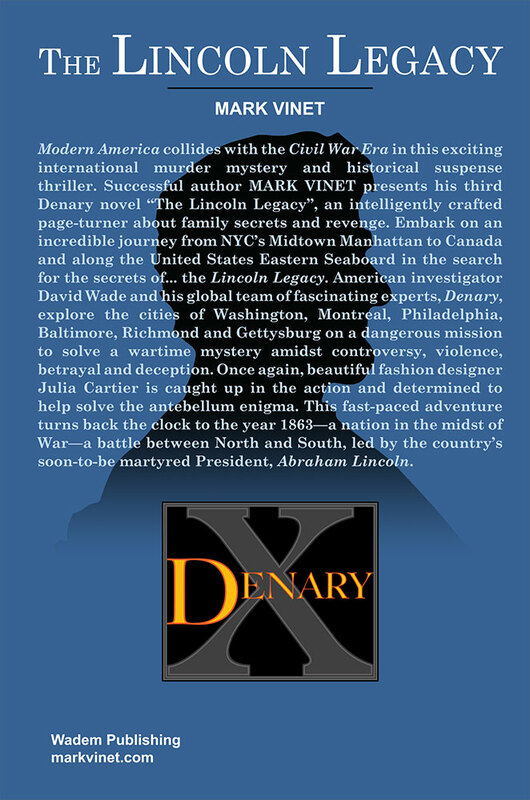 American investigator David Wade and his global team of fascinating experts, Denary, explore the cities of Washington, Montreal, Philadelphia, Baltimore, Richmond and Gettysburg on a dangerous mission to solve a wartime mystery amidst controversy, violence, betrayal and deception. Once again, beautiful fashion designer Julia Cartier is caught up in the action and determined to help solve the antebellum enigma. This fast-paced adventure turns back the clock to the year 1863—a nation in the midst of War—a battle between North and South, led by the country’s soon-to-be martyred President, Abraham Lincoln. Modern England collides with the Elizabethan Era in this exciting international murder mystery and historical suspense thriller. Successful author MARK VINET presents his sophomore novel “The Dead Letter”, an intelligently crafted page-turner about family, greed and intrigue. 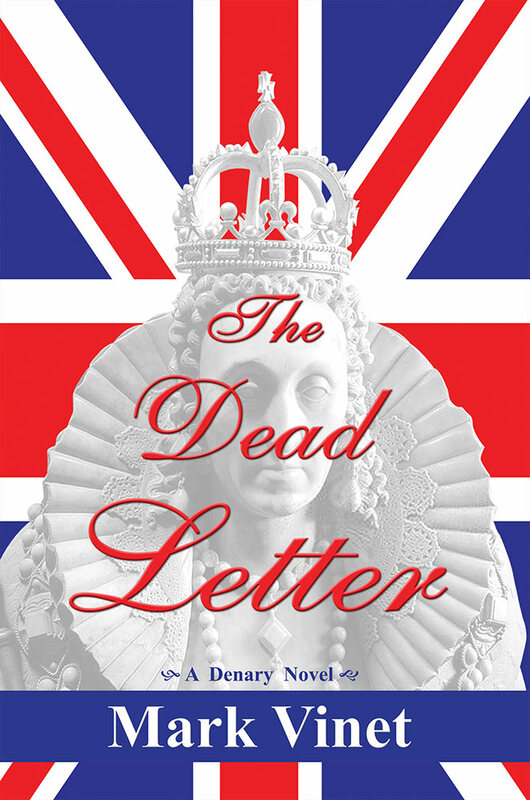 Embark on an incredible journey from NYC’s Central Park to the United Kingdom in the search for the contents of... the Dead Letter. 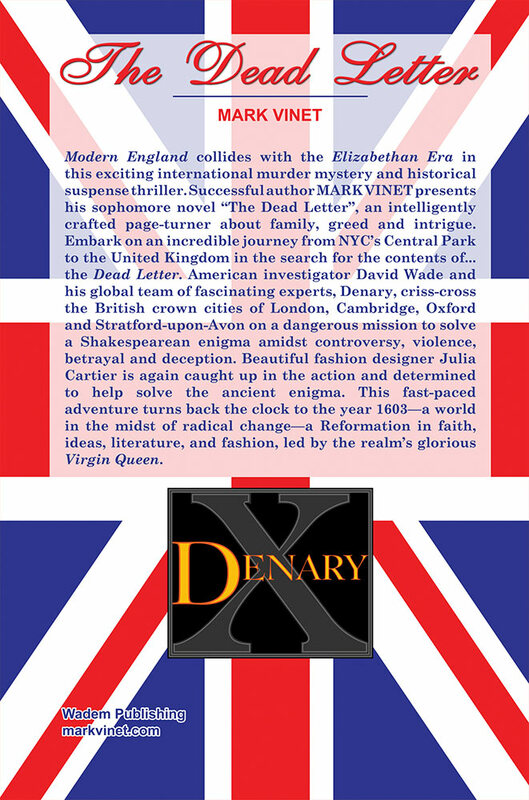 American investigator David Wade and his global team of fascinating experts, Denary, criss-cross the British crown cities of London, Cambridge, Oxford and Stratford-upon-Avon on a dangerous mission to solve a Shakespearean enigma amidst controversy, violence, betrayal and deception. Beautiful fashion designer Julia Cartier is again caught up in the action and determined to help solve the ancient enigma. This fast-paced adventure turns back the clock to the year 1603—a world in the midst of radical change—a Reformation in faith, ideas, literature, and fashion, led by the realm’s glorious Virgin Queen. 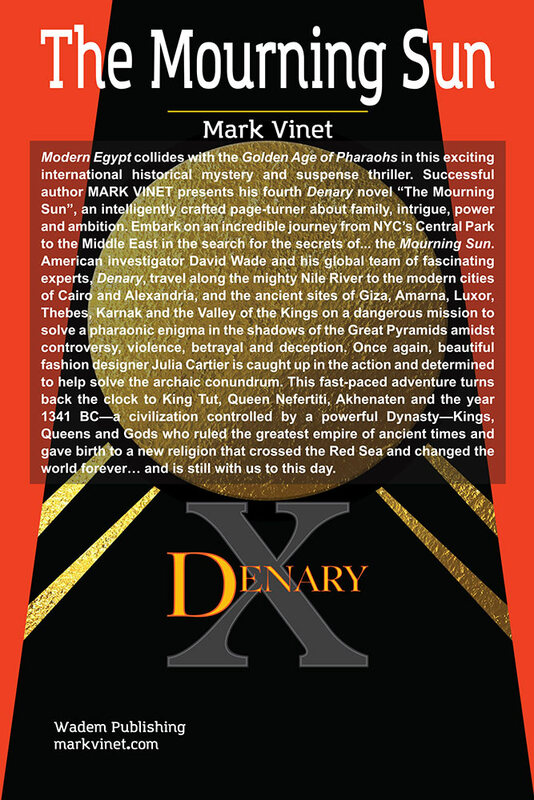 Da Vinci Code meets Mission Impossible in this exciting international murder mystery and historical suspense thriller. 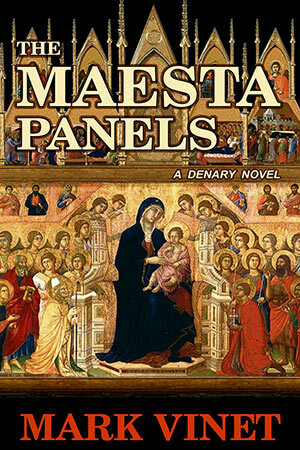 Successful non-fiction author MARK VINET presents his debut novel "The Maesta Panels", an intelligently crafted page-turner about family, greed and intrigue. 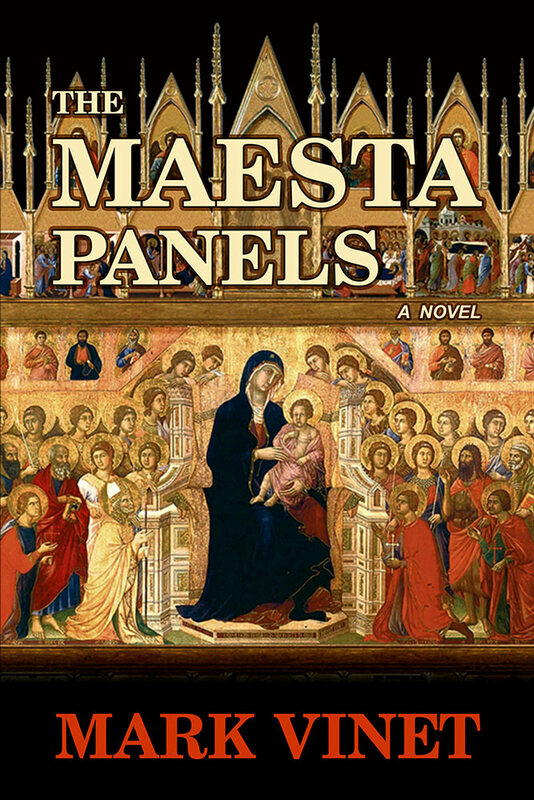 Embark on an incredible journey from NYC's Empire State Building to Northern Italy in the search for religious art treasures that have been lost for centuries... the Maesta Panels. 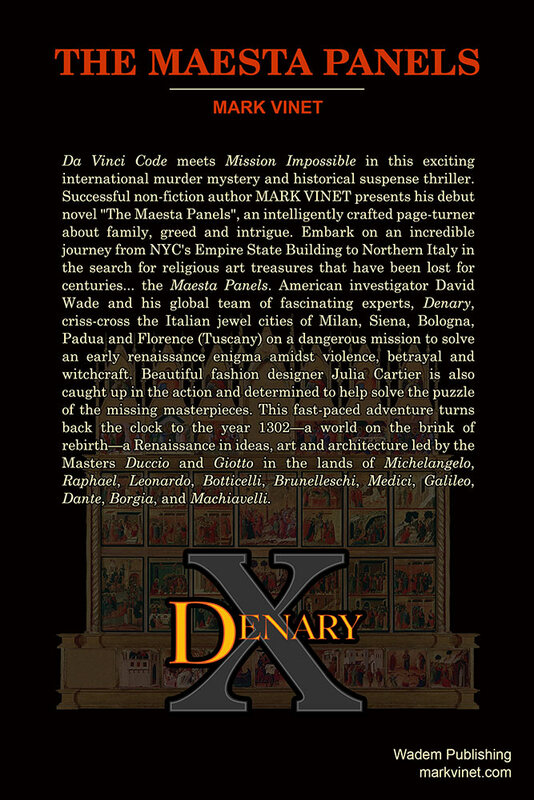 American investigator David Wade and his global team of fascinating experts, Denary, criss-cross the Italian jewel cities of Milan, Siena, Bologna, Padua and Florence (Tuscany) on a dangerous mission to solve an early renaissance enigma amidst violence, betrayal and witchcraft. Beautiful fashion designer Julia Cartier is also caught up in the action and determined to help solve the puzzle of the missing masterpieces. This fast-paced adventure turns back the clock to the year 1302—a world on the brink of rebirth—a Renaissance in ideas, art and architecture led by the Masters Duccio and Giotto in the lands of Michelangelo, Raphael, Leonardo, Botticelli, Brunelleschi, Medici, Galileo, Dante, Borgia, and Machiavelli.